A common mode choke is an electrical component, comprised of two coils wound on a single magnetic core, that operates as a passive inductor which blocks an electrical circuit’s higher-frequency AC current while passing signals of lower frequencies and DC by having a reactance-defined impedence proportional to its frequency. A through-hole mounted common mode choke. 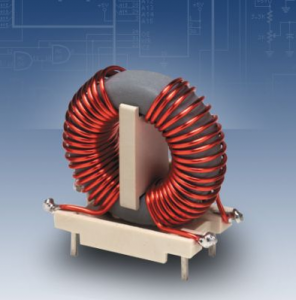 Like standard electrical chokes, common mode chokes are used as inductive components in electronic filters, having large inductance and very small resistance, and thus consuming only very low levels of electrical power. A common mode choke is more useful than a standard electrical choke in preventing EMI (electromagnetic interference) and RFI (radio frequency interference) from power supply lines. This, in turn, helps prevent the malfunction of electronic devices. Common mod chokes pass equal but opposite differential currents, and block common mode currents. Precision, Inc. offers a large common mode choke selection, in a range of mounting and through-hole styles. Since 1919, the company has been manufacturing a wide variety of top quality custom and standard electrical devices.